If you’ve just joined us in this blog, stick around, because in the coming posts I will cover everything you need to know about getting a piano or keyboard into your home ready for playing! This post follows on from Part 1. The obvious upside to a keyboard is that you can turn the volume knob up or down depending on your audience (or lack thereof) and that ol’ saviour, the headphone jack, is there for your housemates sanity and your complete, uninterrupted immersion if you so wish. The piano doesn’t have that. But it does have a damper pedal to give a slightly muted sound. And here’s the other thing about using a piano, you will learn to be very good at volume control with your fingers and this should not be undervalued – control of your dynamics (loud and soft playing) can be the difference between a correctly played piece and a transcendently beautiful piece. It’s all in the dynamic range. In my case, I practised piano early in the morning before school in order to get through my exams, so headphones were essential. My parents bought me a Clavinova digital piano for this purpose and sighed in relief the first time I plugged that headphone jack in at 7am. It has to be said: The thumping noise of the pedal and the thudding of the piano keys is often overlooked – people may prefer to actually hear the music rather than just hearing incessant thudding. You can work on the pedal part – your foot should be going up and down with control, not sliding off the side and creating a loud ‘thwack’ sound as it hits the piano frame with force (though it makes for a good percussion sound in my opinion!). The thudding of the keys, though, cannot be saved. You need to be unhindered in that regard and if anyone needs consoling, remind them they are lucky you didn’t take up drums! Don't know your MIDI from your polyphony? Download this free cheatsheet of keyboard functions + features so you know exactly what you're after in an instrument. Well done! 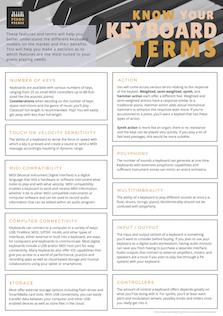 You've signed up to receive an instant download of the free keyboard terms cheatsheet. Here's the download. Thank you for subscribing, you will now receive a weekly newsletter from Piano Picnic HQ. The acoustic piano is the most authentic of the two, period. Digital pianos are getting so close to that beautiful sound but they just cannot encompass the key feel, weight, tone and resonance of that big, wooden box. Keyboards, though, have an amount of freedom of experience that the piano does not. You can experiment with different sounds, try out the pitch wheel and experiment with volume fading, and this is at the most basic level. The fancy models will provide more gizmos than you can shake a baton at – not to mention the world of technology available to you when you plug your MIDI or USB cable into your computer or iPad. The world of music-making and audio manipulation apps is mind-blowing and can add a whole new exciting level of exploration to your piano learning. In between note passages have a go at drumming out a beat on the side, top, or underbelly of the casing. Blend all these techniques and you have yourself an experimental performance! The solidity of the acoustic piano can be a positive. There’s no worrying about it getting knocked over or plugs pulled out or bent (messing up the sustain pedal input is not advisable in my experience). While the elephant in the room, that’s your acoustic piano, is hard to ignore – it’s big, it’s heavy and it’s not going anywhere without a fight. Some pianos are heavier than others, I had one such ‘heavier’ piano and it took six grown men to lift it off a trailer into a first-floor room where it stayed until I sold it. The woman who bought it from me was smart and got movers to collect it, avoiding having six sullen coworkers the next day with stiff backs. Lesson learned. The keyboard is wonderfully mobile, you can take it to a gig, play in the park (if you get a small generator or battery) you can move it around the house depending on where the sun falls or how your mood is placed. The piano is not so mobile, but it’s workable – I’ll go into tips for moving a piano in later articles. If you have the spare change to get yourself a shiny new piano then you can’t really go wrong. It’s a matter of taste, so you’ll need to go to a local shop or shops and try a few different pianos out and see which tone and action you prefer. With used pianos and keyboards you don’t have to spend nearly as much. But you do need to learn a few things about the older instruments to know what you’re looking for and to avoid the lemons. That’s covered in the next post!